"We called him 'The Knife' because when he'd get up to blow, his playing had almost a slashing effect on the rest of us. He'd slash, chop, and before he was through, cut everybody down to size." Pepper Adams, a scholarly looking, strong-toned baritone saxophonist, who placed first in the "New Start--1957 Down Beat Critic's Poll" makes his initial Blue Note appearance on this record. Born in Highland Park (a suburb of Detroit), Michigan in 1930, Pepper moved to Rochester, New York when he was five and began listeneing to people like Fats Waller over the radio when he was in the first or second grade. He lived in Rochester until he was sixteen, picking up the tenor when he was twelve, and digging in particular the big bands of Jimmy Lunceford, Lucky Millinder, Cab Calloway and Duke Ellington. He played with his high school band and local groups and collected records by Ellington, Coleman Hawkins, Art Tatum, Benny Goodman, Don Byas, Charlie Christian, et al. He moved back to Detroit in 1946 and switched to baritone, then worked his first big-time gig with Lucky Thompson. After that he played with just about all the young Detroiters who were eventually to make a success in the east (most on this label); Barry Harris, Billy Mitchell, Kenny Burrell, Tommy Flanagan, Paul Chambers, Don Byrd, Doug Watkins, Curtis Fuller, the Jones Brothers and Yusef Lateef. Sonny Stitt, Milt Jackson and Wardell Gray were others with whom he worked. Pepper remained in Detroit until early 1956 when Oscar Pettiford got him a gig with the Stan Kenton orchestra. That band broke up six months later in Los Angeles, but Pepper stayed on the coast to work with Dave Pell, Shorty Rogers, etc. He came back east with the Maynard Ferguson big band--quit it in New York and then returned to the west with Chet Baker. Once again in L.A. Pepper left Baker and came back to New York where he has since remained. He says that Hawk, Harry Carney, and Wardell Gray have been his biggest influences and names Carney and Cecil Payne as his favorite baritonists. 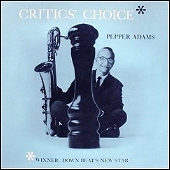 A selected discography of Pepper Adams albums. 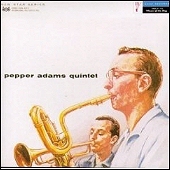 The Pepper Adams Quintet, 1957, VSOP. 10 To 4 At The Five Spot, 1958, Prestige. Conjuration: Fat Tuesday's Session, 1983, Reservoir. The Adams Effect, 1985-86, Uptown.